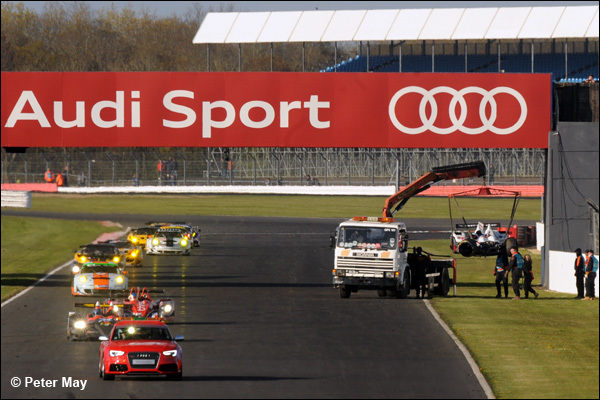 They only led 6 of the 118 lap race distance at Silverstone but crucially for the #46 Thiriet by TDS Oreca-Nissan four of those were the last four of the race. Pre-event, we warned about the stealthy, consistent pace of this entry and they flew relatively under the radar until midway in to the four-hour season opener yesterday afternoon. 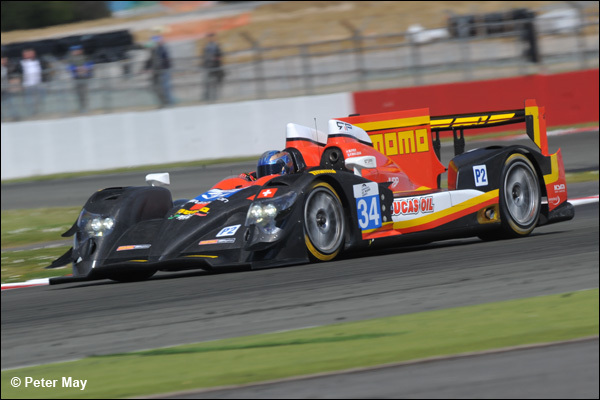 Pierre Thiriet completed the first two stints in a very solid fashion after teammate Tristan Gommendy qualified 5th. Thiriet’s time in the cockpit was very impressive with his fastest lap, set on lap 5, four-hundredths of a second quicker than Gommendy’s best in the race. Thiriet set a firm foundation for Ludovic Badey to then showcase his previously hidden qualities. Badey has little LMP2 experience, bar an exploratory outing at Le Mans last year with the team but anyone who saw some of his recovery performances in the TDS BMW Z4 in Blancpain last season were left in no doubt, that along with Thiriet, he is one of the best ‘silver’ drivers around. He is unfashionable and goes ‘under the radar’ but his application and intelligence on building his pace throughout a stint is searingly impressive. He hunted down Romain Brandela in the third hour and despatched of him ruthlessly, before handing over to Gommendy with the car a solid third. Yes of course the team were fortuitous with the Safety Car and Gommendy initially struggled to reel in Michel Frey, due to the Race Performance team having a set of fresh Dunlop’s bolted on at the final ‘safety car’ stop. However, superior racing nous through late-race traffic ensured a way through in to Stowe and the job was done at that crucial moment. An excellent job it was too, by the whole TDS by Thiriet Racing team. Well done to them on a great start to the 2014 season. 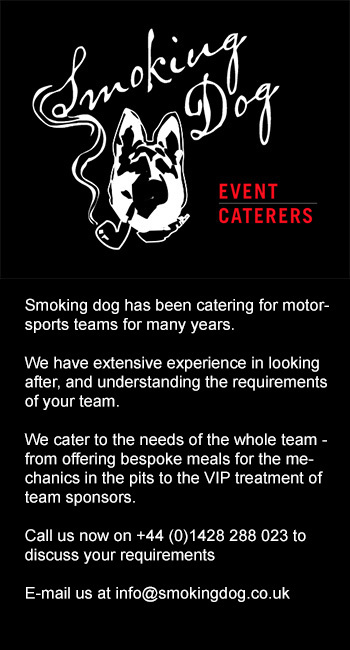 Motor-racing….bloody hell! If any weekend encapsulates the rollercoaster ride of this wonderful discipline of the sport then Race Performance’s start to the season says it all. Last Friday was anything but Good for Michel Frey’s troops when he watched forlornly as his recently re-built Oreca-Judd came back to the paddock on a flat-bed truck after a rare error from Mailleux at Becketts. Thankfully this damage was nowhere near as bad as that inflicted at Paul Ricard three weeks previously when a rear suspension failure pitched their original race chassis in to the barriers at 130mph! Still, the incident lost plenty of track time for the Swiss team. Yet it seemed to galvanise them even more. Mailleux was magical in qualifying, grabbing a front row position with a near perfect 1m48.854s lap. Frey started the race with a double stint and did superbly. Initially holding 2nd at the end of the first lap, he was swamped a little in the early stages and was bumped down to 5th. 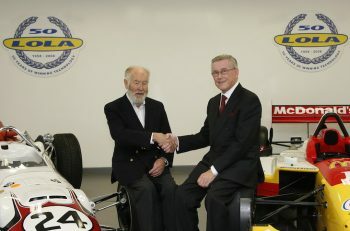 But his head never dropped and after getting back in to the groove, he disposed of Pierre Thiriet at Aintree on lap 22. Stopping on the same lap as the Thiriet by TDS Oreca (on lap 24), the Swiss driver stayed in the car, holding a clear 5th place before inheriting a brief lead at the second stops, when he handed over to Mailleux. ‘Fast Franck’ then hustled the car up to second place, catching the race leader Simon Dolan after reducing the gap from 16 seconds to 3 seconds. But with the knowledge that Frey had to do the final stint, whereas Jota Sport had pole position setter, Harry Tincknell on hand, a chance at victory seemed to be a lost cause. But Dolan crashed on lap 97 on his in-lap and possibilities opened up once more. Immediately as the Safety Car came out Mailleux pitted, Frey got back in the cockpit and the team bolted on a fresh set of Dunlop’s. Frey’s pace was mighty and it was possibly the best (short) stint he has or will ever do. Yes there was a safety car enhanced clear track and the track conditions were at their best, but still, Frey was impressive and did his best to fight off the seemingly irresistible Gommendy. It looked like he was going to see it out but traffic and experience was the deciding factor. Frey chose the wrong side of the Team Russia by Barwell BMW Z4 exiting Copse and Gommendy pounced and took his chance. The flicker of a victory flame was snuffed out. On paper 3rd place was a decent result for the Swiss team. However, after the momentum of the Paul Ricard test and the pace that Christian Klien showed here in Free Practice, there were some if’s and but’s swirling around the team after the race. A messy qualifying saw Klien spin and damage the car at Becketts, a legacy of running a harder compound Dunlop on the rear left of the car to try and give a better option for pace and also get a fresh tyre for the start of the race. Three tyres used in qualifying must be used for the start of the race. However, the turquoise and black Morgan bottomed-out over a bump and threw CK off, damaging the left-rear bodywork. A steady start saw the Austrian initially bumped back to 7th place but from there he started to make rapid progress, and by lap 16 was up to 3rd place and in a good position. 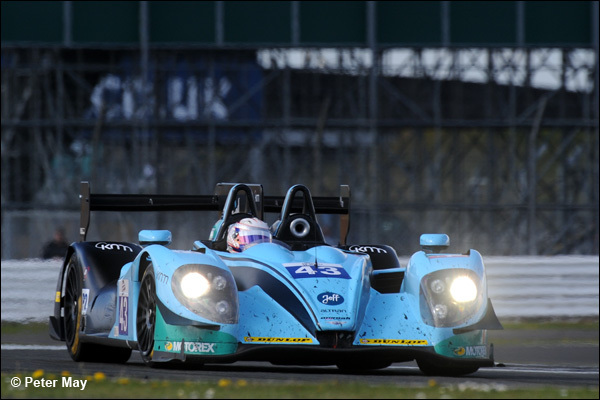 Klien’s second stint saw the Judd powered Morgan settle in to a solid 2nd place once he had taken Simon Dolan’s Zytek. As the bronze driver and with little experience of high-downforce prototypes not much was expected from Romain Brandela, but the Frenchman did a respectable job and didn’t make any mistakes during his ‘minimum’ stint. Indeed, Brandela took Tony Wells for 2nd place but then eventually lost this to the charging Ludovic Badey on lap 65. Gary Hirsch took over and fought gamely, again with the Thiriet by TDD Oreca for what was then 3rd position. This became a battle for 2nd place after the safety car and the reigning LMPC champion did a brilliant job to harry Gommendy , even daring to dream of a chance of victory in the closing stages. Ultimately a last ditch attempt to grab second failed at Club corner, but 15 points is a decent start for Benoit Morand’s bijou outfit. ‘New’ stars in reasonably priced cars…. James Littlejohn really made seasoned observers sit up and take notice in the #28 Greaves Zytek-Nissan, leading comfortably for 20-laps after scything his way through the field in the early stages. Calm and assured the 26-year old, who exploited his intimate knowledge of the Silverstone track to the fullest, gave notice of some serious talent over the weekend. Hopefully there will be further outings for James. James’ driving partner, Tony Wells, also acquitted himself well to LMP2 and the pair are a very welcome addition to the ELMS paddock. The #41 Caterham liveried Greaves Zytek-Nissan placed an excellent 4th with Matt McMurry completing a mammoth 73-laps to test his concentration, pace and fitness to the maximum. He passed with flying colours on all counts and he much enjoyed his impressive display. The 16-year old has a superb team around him, in the shape of his father Chris McMurry and talented team mates/driving mentors, Chris Dyson and Tom Kimber-Smith. Matt is bang on target to become the youngest ever driver at Le Mans (Ricardo Rodriguez was the previous youngest at 17 years and 4 months, in 1959). 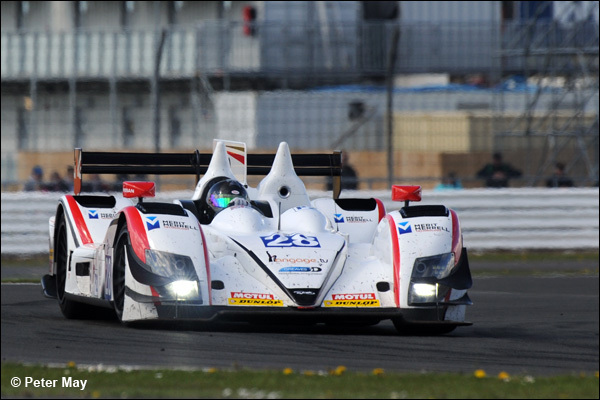 Alex Kapadia was sensationally good in the Murphy Prototype Oreca-Nissan all weekend at Silverstone. With limited running in the first Free Practice sessions, things didn’t get off to a great start on Friday, but in the race he registered the most consistently quick ten-lap sequence of anyone during the recovery from an earlier race stop-go penalty and puncture suffered by teammate Rodolfo Gonzalez. There will be much more on the adventures of Alex this week as he was keeping a detailed diary for us! A quick but deserved mention for Gustavo Yacaman. The US based Colombian was on the back foot almost all weekend after a late arrival at the track. Hamstrung by the insipid pace of teammate Keiko Ihara, Yacaman showed some excellent speed during his stints and was unfortunate to be in the wrong place at the wrong time, when he was innocently caught up in the Dolan/Rugolo incident. The most important outcome of the incident on lap 97 was that apart from some cuts and bruises Simon Dolan is fit and healthy. It was a considerable hit and Dolan’s words of thanks to the Zytek engineers and composites designers are to be echoed to the rafters. The 90-degree angle of the impact was hideous and the Zytek crash-box did its required job. The FIA medical and extrication teams also deserve praise. The race was effectively won for Jota Sport at that stage after a faultless first stint by Filipe Alburquerque and then an equally impressive two and a half hour marathon effort from Dolan, who is now established as one of the benchmark silver drivers and rightly so. 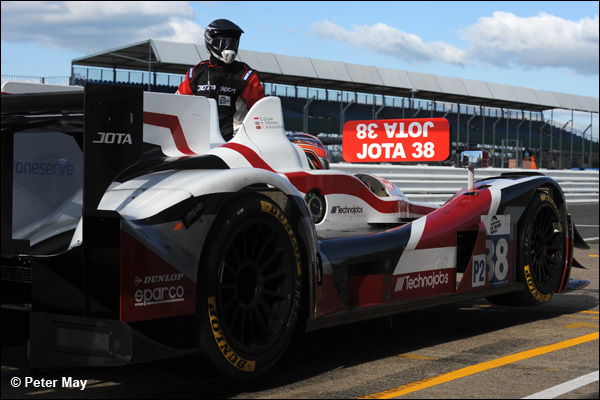 Lapping easily in the 1m53’s and 54’s, but peaking with a superb 1m52.137s lap, the Jota Sport Zytek-Nissan laid claim to be the moral winner of the 4 hours of Silverstone last weekend. With Franck Mailleux’s Race Performance Oreca catching him, Dolan, who was on his in-lap to hand over to Harry Tincknell, attempted to overtake the AF Corse Ferrari 458 of Michele Rugolo on the exit of Chapel corner, just before the Hangar straight. The Italian, surprised by the move, unintentionally forced Dolan on to the grass and from there it was a very wild ride trying to control the bucking Zytek. Rugolo was, like Dolan, invited to talk about the incident with the race director Eduardo Freitas afterwards, no action was taken over the accident. It would be way too harsh on Dolan to suggest he was wholly at fault for the incident. But in hindsight he need not have attempted to pass Rugolo at Chapel with the Hangar straight just around the corner. He kept his foot in, and just as he re-joined the track it ‘gripped’ exited stage left and the rest played-out in a bruising encounter with the wall. 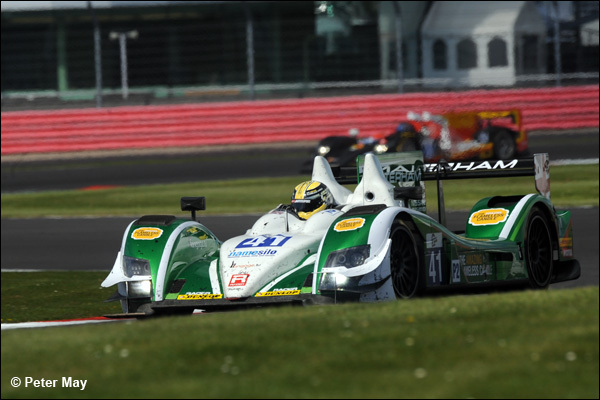 It was all an unfortunate and underserving way for a back-to-back Silverstone ELMS win to elude Jota Sport. Up until that point it had been a quality weekend for them, because on pace, driver line-up (Tincknell was mighty in qualifying) and strategy, it was close to perfection. The team will surely get their just rewards with race wins and a probable crack at the title this season. A word on the tyres….. It seemed that the Zytek’s were the easiest on the tyres relative to the Morgan and Oreca’s, The Alpine especially seemed to suffer more than their counterparts with the front left toward the end of the second stints. Increasing understeer crippled Panciatici’s second stint. Some drivers coped better than others by altering their style, especially on turn-in to the Becketts/Magotts complex by turning in early on the brakes to use the rear tyres more. “We were really quick, I think in the end we were good enough to finish first second or third on this track. The traffic was terrible, there was a big difference between the prototypes and GTs in the corners, that’s why it was really tough. “It was really hard actually. We started P6, and I lost a position at the first corner, I was on the outside and the left side were overtaking as the green lights came on. After that it was pretty hard in traffic but I made some improvement and got up to P4 but I lost the positions again, it was extremely difficult to handle the traffic. It was a belter of a race. Action throughout the four hours in all three classes and justification for the teams that they lobbied the organisers to get the race time extended. 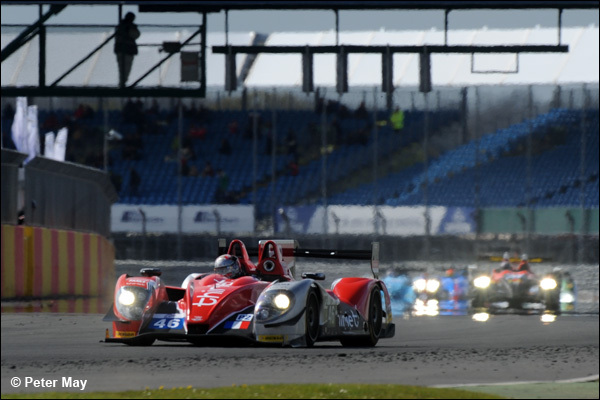 The quality and quantity in every class is up on 2014 and the short and medium term future for the ELMS looks bright and rosy. Roll on Imola!